The three events were all under the umbrella of the ‘impact week’ showcase – three days (Tuesday to Thursday) designed to position Botswana as the centre of gravity for the diamond industry and the benefits it can bring. A host of high-profile speakers from government, industry and academia as well as fashion, the media and sports addressed the conferences. The trio of events started on Tuesday with the De Beers 2017 Diamond Conference run in partnership with Botswana’s Ministry of Mineral Resources, Green Technology and Energy Security and in collaboration with the United Nations Office of Partnerships. The theme was sustainability, influenced by the 17 UN Sustainable Development Goals (SDGs). 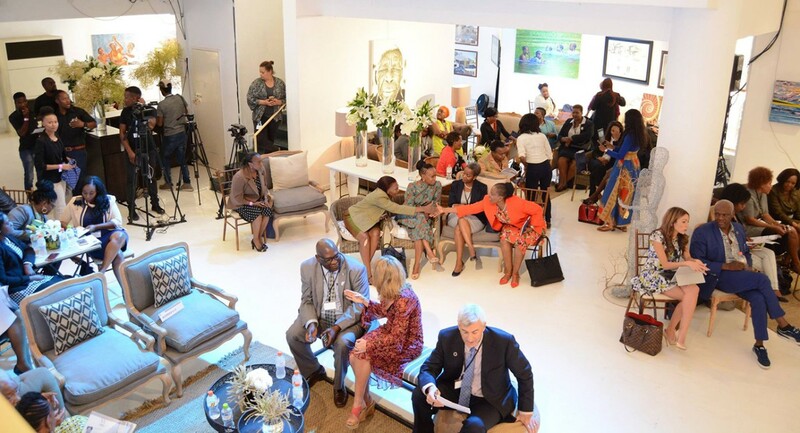 Around 400 people from southern Africa, mainly Botswana, attended the conference where about 30 speakers from the world of politics and business, in particular the diamond industry, gave their take on creating sustainable shared value. Keynote speaker was Lieutenant General Dr Seretse Khama Ian Khama, President of the Republic of Botswana. Sadique Kebonang, Minister, Mineral Resources, Green Technology and Energy Security, also spoke. The conference, now in its third year, focused on ways the diamond sector could be a catalyst in developing responsible business growth and unlocking innovation. One session set out the business case for sustainability. The company had, he said, recently taken a closer look at the industry’s support for achieving the SDGs, and its initial findings had been summarised in a new ‘Diamond Dialogues’ publication, launched on the day of the conference. The next day was the Entrepreneurship Catalyst event, which was aimed at inspiring young people from Botswana to explore opportunities in the entrepreneurship sector, as part of De Beers Group’s commitment to building sustainable economies in southern Africa. Youth, one session suggested, was the best return on investment. Olympic gold medallist Carl Lewis and Dr M’zèe Fula Ngenge, Chairman of the African Diamond Council, took part in panel discussions, and the keynote address came from Thapelo Olopeng, Minister of Youth Empowerment, Sport and Culture Development, in the Botswana Government. The event, attracting around 500 young entrepreneurs, also saw a host of discussions on the recent launch in Botswana of the De Beers Stanford initiatives – two programmes in partnership with Stanford University aimed at developing managers and budding entrepreneurs. On Thursday, the spotlight turned to women. Around 130 people, mostly women, were at the W Summit, which focused on women in business leadership. It highlighted ways for women in developing countries to tap into opportunities for sustainable economic growth. At the conference, De Beers Group and UN Women, in collaboration with Botswana’s Ministry of Nationality, Immigration and Gender Affairs, announced a BWP8 million three-year programme to support women micro-entrepreneurs in villages in the Okavango Delta and Kweneng District. The programme, to be launched in early 2018, will equip women micro-entrepreneurs with business management skills, an understanding of markets and marketing, and technical skills, especially in agricultural activities. The summit comes soon after the announcement that De Beers Group has forged a three-year partnership with UN Women to accelerate the advancement of women. Part of this involves investing US$3 million to support female micro-entrepreneurs and science, technology, engineering and maths students in the Group’s diamond-producing countries and will promote gender equality through its marketing campaigns. One of the summit sessions was headed ‘The Future is Female’, which showed how brands and campaigns needed to reflect the evolving roles of women in society; another looked at how women who have reached senior positions can help others climb the ladder. This event also featured a range of high-profile figures, including Dr Precious Moloi-Motsepe, Founder and CEO of African Fashion International as well as Deputy Chairperson and CEO of the Motsepe Foundation (which aims to reduce poverty through education). In action in the panel discussions in the three conferences were topline figures from around De Beers Group, including Mpumi Zikalala, Senior Vice-President of De Beers Sightholder Sales, South Africa; Stephen Lussier, Executive Vice-President, Marketing; David Prager, Executive Vice-President, Group Corporate Affairs; Pat Dambe, Vice-President, Corporate Affairs and Government Relations; Feriel Zerouki, Head of Government Relations for De Beers Group; and Rebecca Aaku, Manager, Government Relations. The W Summit is being live streamed on De Beers Group's Facebook page. View footage from the Diamond Conference on YouTube. Footage from the Entrepreneurship Catalyst event can be found on the Youth Innovators Facebook page.